The number of respondents to the survey is impressive, and Gallup is a highly experience and reputable organisation, but before you rethink all your marketing strategies, it is worth pausing to consider the methodology of the research. 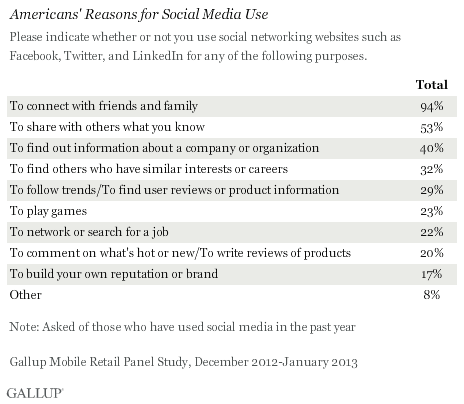 The question Gallup asked was “How much do social media typically influence your purchasing decisions?”. To which 5% replied “A great deal of influence” and 30% said “Some influence”. Social media – as Gallup should know – encompasses a bewildering array of places and ways in which human beings now communicate with each other. Tripadvisor is part of social media; so are the reviews on Amazon and almost every other retail website; and so is Mumsnet and the professional photographer’s forum my partner sometimes dips into (and certainly takes note of when wondering about which new lens to buy); and so are Jancis Robinson’s and Robert Parker’s and Jamie Goode’s websites, especially if you take account of the responses they feature from readers. When you start to include all of these, I’d reckon that the answers might be a little different, What if, Gallup had, for example, asked “If you were looking at purchasing a washing machine on a website where 100 people had given it an average mark of 2 stars and, in many cases made detailed negative remarks about its reliability, might this, just, possibly, make you reconsider your choice? And what if the pollsters had said “Are you really 100% sure that those gorgeous pictures your friend posted of their holiday in Corfu, and the comments they made about the amazing cheapness of everything there, didn’t even slightly make you think of going there?”. Most surveys concur that the biggest reason the majority of people choose to do anything is the recommendation of friends and family – the very people Gallup’s respondents say they connect with on ‘social networking websites such as Facebook, Twitter and Linkedin’. Is it just conceivable that, in some of the communication between all these friends and family members, there might not be some mention of products and services they have used and liked? Yes, social media is sometimes overhyped – like lots of other things. But today it is part of most people’s daily lives; taken for granted in much the same way that we take cars, trains, planes and buses. In other words, don’t simply rely on social media to build your sales. You also need to offer a decent product and service. Thank goodness Gallup pointed that out. Social media is now (and will be ever more important in the near future). To up sales however, social media should be combined with more traditional media channels. Take for example a recent tour organised by Ted Lelekas to Nemea, to promote Greek wines there, for a group of people in the wine trade associated with the hashtag #winelovers. In and of itself, it was wonderful and that particular network echoed the visit, with Facebook postings garnering many likes – certainly leading to people wanting to go to Nemea, including myself. But has it actually lead directly to more sales of Nemea wines in foreign markets? Perhaps. I noticed that some people on that tour are actually selling wines outside Greece. Others were WSET students who could spread the word to their contacts. However, an article appeared in the influentual Greek daily Kathimerini about that visit and that was “more serious” because of the greater reach, greater readership of people not in the wine trade. So you need to combine social media with media “tout court” to get some traction. As a journalist I know that international news agencies based in foreign countries read the media of those foreign countries, still as a reference. Talking about social media is meaningless. You have to look at metrics like reach and influence. If Robert Parker wrote a single line on Facebook extolling some wine, it would sell like stink. If a bunch of wine geeks all tweeted passionately for days about some wine they enjoyed, it might not shift a bottle. Influence, whether from social media, old media or word of mouth, is built the same way: through the credibility of the person/company spreading the message. Social media is just an amplification of an old truth: we trust people we know. That can't be manufactured instantly, even if digital tools are faster. In the case of Wines of Lebanon, the problem wasn't that they spent money on print, it's that their fundamental business (distribution) wasn't in place when they started talking. If they'd had a good distribution system, the strategy of engaging opinion formers would absolutely have worked at that time. I guess the question would then have to be asked: why aren't people buying? There is clearly an issue, whether it's pricing, or taste profile, or product differentiation. When I worked in advertising, the truth that was drummed into us was that nothing kills a product that doesn't work faster than good advertising. You are making a very good point – as usual. I also love Portuguese wine but, if I were a big commercial wine business, focused at supplying an existing demand – however latent – the current Portuguese offering is not what I'd be looking for. A) there is neither a sufficient amount of familiar grape varieties, nor a single, easy-to-remember local variety to promote. C) Apart from Lancers and Mateus – both tired brands associated with rosé – there are no brands. D) There is no labelling consistency (unlike the typical 'Spanish' label. All of the widespread coverage has focused on what critics and sommeliers find interesting rather than anything that resonates with consumers.